Greg Caggiano is a historian, author, and speaker. Visit his other blog eatingnewjersey.net for more. Mallon in “Gods and Generals”. From the first times I watched Gettysburg and Gods and Generals, until now, the one performance that always stood out to me was Brian Mallon as General Winfield Scott Hancock, commander of the United States Army’s first division during the American Civil War, and a General present at major battles such as Fredericksburg, Antietam, and Gettysburg. With two films loaded with star power, I wanted to delve deeper into the supporting cast, and that is where I came across Mallon, who is a veteran actor of both film and theater here in the US, as well as England, Wales, Scotland, and Ireland. Other than the two films mentioned above, he has appeared in Some Mother’s Son, The Informant, and Gangs of New York, among others. Each of his performances has left me asking for more screen time for him, something I noted in my two Civil War movie reviews. Not only does he bear a resemblance to the real general, but his voice and mannerisms have the audience feel as if they are watching General Hancock himself, especially when he discusses his friendship with Confederate General Lewis Armistead. Yet every time I watched him, I always thought he reminded me of someone else, and could never pinpoint who it was, that is, until I checked out his website and saw that he has starred as Richard Burton in a one-man show titled Playing Richard Burton. It was then that I realize it was Burton who he bore striking resemblance to—he can even get his voice to be identical to that of Burton, including when he did a voice-over for a musical version of War of the Worlds, in which an animatronic Burton appears as part of the cast. 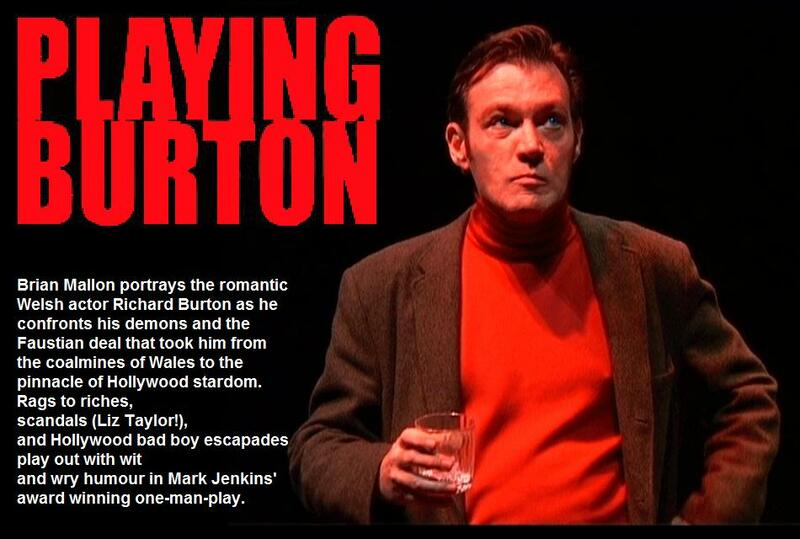 His portrayal of Burton has been called by the New York Post, “[A] robust and dramatic essence of the late Richard Burton being captured on stage…Mallon miraculously re-creates the brilliant Richard.” The national newspaper of Wales, The Western Mail, has said, “This production is almost as good as having Richard Burton still with us.” Reading these reviews only made me want to talk to him even more. Mallon has also received critical acclaim for his starring in Secrets of the Celtic Heart, a play directed by actress Ellen Burstyn, and his appearance in an episode of PBS’s Great Performances. Hancock rallies his frightened troops at Chancellorsville. (G & G). GC: Before we begin, I just want to say that it is an honor to talk to you because Gettysburg was a film I watched when I was little, and it turned me into the Civil War enthusiast I am today—your portrayal of General Hancock was a big part of that. And also, I thank you for reading the reviews on my site. Not many people I interview actually read through it. BM: I thought they were good, very thoughtful reviews with reasonable criticisms. I really enjoyed playing Hancock because he ended up becoming one of my favorite characters out of all those generals, as it turned out. He was the least preachy…he was a democrat (laughs), and his story appealed to me. It’s too bad that [The Last Full Measure], the last of the trilogy, doesn’t seem to be forthcoming. GC: That was actually another thing I was going to ask you about, but yes, Hancock seemed like a very straightforward, to-the-point guy, as you said, not very preachy. BM: And he was so constantly overlooked due to political reasons. He really should have been given a higher rank because his decisions were always the good ones. GC: Now to your career, I want to start out by asking you when you first realized you wanted to become an actor. BM: I suppose it was at the University of Michigan; it was not before that. I hadn’t done anything like that in high school, but at Ann Arbor, a friend of mine from Dublin got me involved with their Civic Theater and we did a play called Hogan’s Goat, and I got hooked on it after that. It wasn’t too long before I went out to New York and went to the Irish Arts Center. I had read about it in the New Yorker Magazine and it was the Irish Rebel Theater at the IAC, so I was expecting something like Lincoln Center and of course it wasn’t. It was something like a little 80 seat theater over in Hell’s Kitchen. But that was good—they put me up because they needed a Gaelic teacher and I was able to do that. I was in a play within three or four days and later on I was the artistic director. Then it was like one thing after another. It was great, I was all connected up immediately. GC: Would you consider that your “big break” or would that have come in film? BM: Film would have to be much bigger. I became a life member of the Actor’s Studio. It was there I met Ellen Burstyn and they made me an observer and then you had to do your final audition and that was pretty good. Actually, it was kind of funny for my final, when I was in a production there of one of Sam Shepard’s plays, Buried Child, and I was playing a guy who was terrorizing this girl by putting my fingers in her mouth and getting off on it, a very weird character to say the least. Then I get a call from Burstyn and she said that Paul Newman, who was running the place at the time, wants you to be a finalist tomorrow and I said that I didn’t have a scene. She said they wanted me to do the scene from the play, and I said there were already four actors in that and the rule was two. She said pretend those two weren’t there and you and the girl just do the scene. So I did it and because [actor] Lee Strasberg had just died, all the heavy hitters were in. Robert DeNiro, Shelley Winters, and Christopher Walken were all in the first row. I did the scene and DeNiro’s hand shot up first and they made me a member. Then when I went around the studio, about eight or nine months later, everyone was asking me about Cape Fear and I said, “What? What?” and they kept saying, “See Cape Fear“. Apparently two days [after watching me perform], DeNiro shot a scene where he puts his fingers in the girl’s mouth. GC: So he got that from your performance? BM: Well, that’s what everyone at the studio was saying and then I read an interview with Juliette Lewis and of course, nobody was expecting that. The opinion around the studio was that served as an inspiration for him. Anyway, the studio was a big break, in that sense. GC: Out of all the roles you’ve played, obviously to me, you will always be General Hancock, so what first attracted you to take his role for Gettysburg in 1993? BM: I was delighted to be offered it. Ron Maxwell came to see me at Cafe Beckett in Hollywood at the time, and we were sitting there talking and he hadn’t told me yet what he wanted me to play, and there’s this friend of mine, an Apache, who was wearing a Civil War general’s hat which was navy blue. Ron laughed and said, “I like your hat.” This friend of mine just puts the hat on my head and Ron thought this was very funny because he was going to offer me the role of this Union general and I didn’t know it yet. My friend then said to me that he wouldn’t take the hat back because it looked so right on me. So Ron thought this was all very amazing because here he was, about to offer me the role of a Union general and I was already wearing the hat. GC: Did you know anything about Hancock or the Civil War before the movie? BM: I knew some about the Civil War but I wasn’t really familiar with Hancock. I immediately learned about him, and of course all the actors found that you really had to know your stuff because you’re dealing with all these terrific reenactors who know everything there is to be known about these things and you better know what you’re doing. I read three books on him, and Sam Elliot who had a researcher doing work for him gave me some of his research that had to do with Hancock. I found it fascinating and since we did the movie, I continued to read up on him which only later added to Gods and Generals. GC: What were your experiences like working for director Ron Maxwell? BM: They were all great. I had a terrific time doing it. Ron is a fine director and his casting is flawless, really. I could not have had a better time. It was amazing to be in certain scenes and the reenactors were so wonderful with the way they brought their own passion and life to it, which is more than what ordinary extras would bring, which is really nothing. I remember waking through the reenactment camp at night when they had their campfires going. Somebody would be playing a fiddle here and there and everyone was still basically in character and it was amazing—it was like time travel. GC: I’m a Revolutionary War reenactor and I work at a historic house in New Jersey, and whenever we do an event, everyone stays in character—we even salute each other. It’s quite funny and intense all at the same time. BM: Yeah, it’s terrific stuff. The more I read about Hancock, the more I liked him. He should have been listened to more. GC: Now the one thing that everyone is asking about is the rumored Gods and Generals director’s cut. I know you alluded to it in your email but can you tell us anything at all about it? BM: Yes, I was just talking to Ron Maxwell about twenty minutes ago and I was told at this point that it will be coming out in April. There will not only be one for Gods and Generals but one for Gettysburg as well. He said that I have new scenes coming into G & G because the whole Antietam section is coming in. GC: I heard that part was about an hour long. I’ve read all different things about it. BM: It’s a huge scene and I’m amazed that it didn’t make it into the film initially. It should be a very much enhanced version. They’re enhancing the color and everything else and he’s in Los Angeles working on it now. GC: This is great information. Do you know how long it’s going to be? BM: I think he said maybe an hour and a half longer than it was. GC: So about five hours in total. I’ve read a bunch of things about it, someone said originally it was going to be six hours, then I read that he screened it once and it was five hours and ten minutes, and now James Robertson just said it was going to be four and a half. But yours is coming directly from Maxwell so it’s the most credible. BM: It might not be the final word on it, cause they’re still working on it. That’s probably why there are so many different numbers. GC: I’m just glad to see Antietam go back in it. I read online that originally the movie was going to be Rated R when Maxwell submitted it and then he made some edits to get it down to PG-13. Since it was such a bloody battle, maybe that’s what got the rating down. BM: It could be, but I can’t imagine why anyone would make these movies R—they’re mad and totally crazy. GC: Yeah, because Maxwell did such a good job in showing the horrors of war and a lot of violence while keeping it at the PG-13 level. BM: As he said, if you wanted the actual reality on the blood, it would be overwhelming after a very short time. People would lose track of the rest of the story if you had soldiers wading through blood. GC: Well, as someone who wants to be a history teacher, that movie is perfect to be shown in a classroom setting. BM: Yeah I think so, and it tells about the actual decisions and how our history depends on people’s character in moments of crisis. GC: I have another question for you, since you’ve become famous for your portrayal of Richard Burton. My friends all make fun of me because I love old movies, and Burton is one of my favorite actors. What can you tell us of your portrayal? BM: Again it was another role that I really enjoyed because I always liked Burton from back in the day and thought he was great. I almost met him once when I was directing a show and knew his daughter Kate. She was in the show and he was doing a play with Elizabeth Taylor on Broadway, Private Lives. Three of the other people in the cast were in one of my shows and Burton said that he wanted to be in it and I said “great” and sent him over a piece to read but later on he told me that he was on the wagon and he was afraid that if he came over he would start drinking again. It was a big disappointment. But anyway, I used to get that a lot, that I looked like him and his daughter was one who said it. I was doing another play with a lot of Welsh poetry in it called Secrets of the Celtic Heart which I was doing in Edinburgh, Scotland and the fellow who wrote the play, his daughter was there and she happened to catch that and he contacted me and wanted me to do it. Eventually I gave in and got into the damn thing. Burton’s whole family came to see it when we opened it in the new Welsh Millennium Center in Cardiff and his family came up from the little village that he was from, and his brother was there and it was kind of funny. Afterward I see the brother and he was talking to somebody but kept looking over at me and I was wondering what he was going to say and finally he gives me the nod to come over. He says (Mallon impersonates a Welsh accent), “Tell me this: were you wearing lifts in your shoes when you were onstage?” (laughs) I said, “Yes I was, actually. Not now, but I was then.” He said, “I thought so,” and looked around, “So did Richard. You’re exactly the same height and exactly the same size from head to toe.” Then he said that he had one criticism for me and I thought, “Uh oh, here it comes” and the brother goes, “You didn’t smoke enough. Richard would never be one minute without a cigarette in his mouth.” (laughs). Mallon doing his famous Richard Burton portrayal. GC: Every movie I’ve seen him in, he always has a cigarette in his hand. BM: Oh yeah, and three bottles of vodka a day. GC: I have to ask, would you be able to do a Richard Burton impression for me? BM: (Thinks) I can’t think of anything. I’m stuck here. BM: “It was all going to happen to me, and I knew it!” I can’t think of anything else here now. GC: I was actually watching a clip of you in the War of the Worlds show supplying the voice for the animatronic Richard Burton, and I thought that was really cool and funny that they would think to do something like that. BM: It is quite an amazing show, and a huge hit over there. They expect to bring it to the United States next year. His head is about twenty feet high and the impression was difficult to do because it is one thing to do a voice-over where you are just supplying the voice and you can see when the lips move and when they stop, but when you’re doing this you have to anticipate his pauses and move your face accordingly. It was amazing work, and I had to learn all of that stuff in a very exacting way. BM: By the way, I just finished up a documentary on the Irish Brigade and this is something that is going to be on the Smithsonian channel. I originally did it for an Irish television channel, and I did it in Gaelic for them and each scene I did over again in English. We filmed a lot of it in various locations in Ireland and then in Antietam, Manassas, and Gettysburg, which was fun going back to those locations. GC: Will that be coming to DVD? BM: I would expect it to. I think there’s a lot of people who find the Irish brigade interesting. GC: Definitely. The fact that they came over here and basically got involved in someone else’s war and fought so bravely sustaining tremendous casualties. BM: Well, yeah, they were used as cannon fodder and that was very controversial in Ireland and a lot of people didn’t like it. GC: Now, you’ve been in a lot of movies and plays, so what’s harder to prepare for? BM: Plays are more difficult. For a movie, you learn it and you’re not really rehearsing with the people you’re in the scene with so then you go and show up and whatever happens happens, and if anything is amiss you have another take. With the play, it has to be exact and correct every time. Films are still very enjoyable and a lot of fun. GC: Do you have any upcoming films or stage performances? BM: I have two films that I’m not really at liberty to talk about coming in the late spring, and I have a stage play I’m going to be doing in Washington D.C. I head there in February to start rehearsals. It’s called The Weir by Connor McPherson and that will take me into May. GC: Now finally, aside from Richard Burton, who is or was your favorite actor? BM: I know that’s an ordinary question but I’m not a good one for rating people. I loved all the guys that Burton was in with: Robert Shaw, Richard Harris, who is just terrific, and Peter O’Toole. GC: Do you have a favorite movie? BM: I’d say my two favorite films are The Last Picture Show and Doctor Zhivago, the original with Julie Christie and Omar Shariff, which is just brilliant. I would never watch another version of it. And then The Last Picture Show is such an amazing film. Bogdanovich did it and there are so many amazing actors in it. It’s in black and white and it’s just something that stays with you. I want to thank Brian Mallon for taking the time out of his schedule to conduct this interview. I really had a lot of fun and learned a lot, and of course, getting some inside scoop on the Gods and Generals director’s cut was really cool. I still consider Brian to be one of the more underrated actors I have ever seen, and hopefully he will get more exposure so that more may learn of his many talents. Thank you! And although TLFM doesn’t look like it will be made now, who knows. The next four years are the 150th anniversary of the war, so if it’s gonna happen, it will be then. actor. I am looking forward to seeing Brian Mallon on screen again. It will be fascinating to see new General Hancock scenes in the two movies. If you go to http://www.brianmallon.net/contact.html and look on the left, you will see an ad for “War is Kind”. After all these years searching. Thank you. I”m afraid i’ve sent money to this address, but it was returned. Note on envelope said, this company no longer at this address. Just so everyone else knows. This would have been nice to have. be one of the reenactors that Mallon talked about visiting the camps on the set at night. One of the Assistant Director’s asked if he could bring one of the actors over the gain a feel and it was Brian Mallon. As was typical then and now guys started to bring out instruments and songs were sung and flasks were passed about. Mallon was with us to the wee hours signing and we even got him to do a couple of songs in Gaelic. Since set calls were early he and we got very little sleep. His first scene that day was when he rides over the Stannard’s Brigade and orders it forward to flank Kemper. He proceeds to rip his hand on the pummel of the saddle and is bleeding badly, enough that they had to bandage his hand. You can’t see it because of the gloves. The orginal version of the Gettysburg movie was 5:37 long. I happended to see it at the Civil War Institute at Gettyburg College. It was suppose to be a mini series but MAxwell wanted on the big screen. Picketts charge was the full length from the time they closed the guns and marched forward. Some good scenes of Devil’s Den are missing. Hopefully the mistake of never releasing the full cut will be corrected. Thanks for sharing such a great story! And it looks like the final cut will finally be coming this spring! Thank you so much for your comments and interview with Brian Mallon. He has been my favorite actor since I first saw Gettysburg in 1993, and it is wonderful to know someone else feels the way I do about his acting. I had never heard of Mr. Mallon until I saw the film and his acting just drew me in. I don’t think I ever saw such natural and flawless acting; it was like he was channeling the real Hancock. 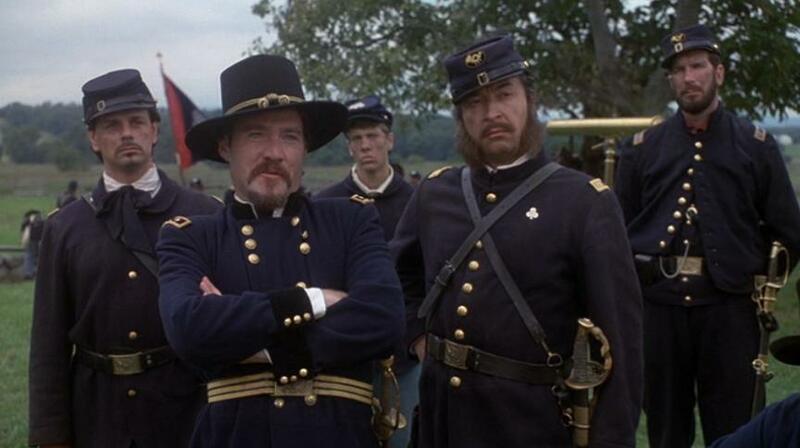 I am thrilled to know that a longer version of Gods and Generals is coming with much more screen time for Mallon. We fans don’t get to see enough of this brilliant actor, so I can’t wait to see the it! And, any way you could put up more photos? Please keep me posted on Brian Mallon! Thank you and I’m glad you enjoyed it! Will try to find some more screenshots of Brian as Hancock, or you could visit his official site (linked in article) for more on his entire career. Can you please update us when you find out any info regarding the two movies Brian Mallon says are coming out in late spring? Thank you. Brian’s Irish Brigade documentary just premiered on the Smithsonian Channel March 17. Still waiting to hear of a DVD release. Greg, just wanted to tell you that you are a fabulous interviewer! You ask interesting questions and cover what we want to know! Keep up the great work here. I know you are going to have a wonderful career! How did you get to be so good so young? !